شاهمیرزایی, حسین, افشاری, مجید. (1396). بررسی خواص الاستیکی و پیزوالکتریکی SrHfO3و اثر تنش تک‌محور بر خواص پیزوالکتریکی آن: بررسی ابتدا به ساکن. نشریه علمی - پژوهشی هیدروفیزیک, 2(2), 51-65. حسین شاهمیرزایی; مجید افشاری. "بررسی خواص الاستیکی و پیزوالکتریکی SrHfO3و اثر تنش تک‌محور بر خواص پیزوالکتریکی آن: بررسی ابتدا به ساکن". نشریه علمی - پژوهشی هیدروفیزیک, 2, 2, 1396, 51-65. شاهمیرزایی, حسین, افشاری, مجید. (1396). 'بررسی خواص الاستیکی و پیزوالکتریکی SrHfO3و اثر تنش تک‌محور بر خواص پیزوالکتریکی آن: بررسی ابتدا به ساکن', نشریه علمی - پژوهشی هیدروفیزیک, 2(2), pp. 51-65. شاهمیرزایی, حسین, افشاری, مجید. بررسی خواص الاستیکی و پیزوالکتریکی SrHfO3و اثر تنش تک‌محور بر خواص پیزوالکتریکی آن: بررسی ابتدا به ساکن. 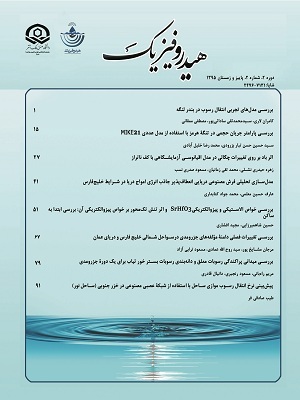 نشریه علمی - پژوهشی هیدروفیزیک, 1396; 2(2): 51-65. ر این مقاله از محاسبات اصول اولیه در چارچوب نظریۀ‌ تابعی چگالی و نظریۀ‌ اختلالی تابعی چگالی، برای بررسی خواص الاستیکی و پیزوالکتریکی حالت پایۀ ترکیب فرضیSrHfO3 درساختار چهارکنجی با گروه فضایی P4mmاستفاده شد. برای پی بردن به ماهیت فروالکتریکی ماده در مقیاس اتمی، قطبش و تانسور بارهای مؤثر بورن محاسبه شدند. نتایج نشان می‌دهد که بار مؤثر بورن اتم‌های Hf و O بسیار بزرگ‌تر از مقادیر معمولی یونی است که نشان‌دهندۀ‌ پیوند قوی میان اتم‌های O و Hf است. محاسبۀ انرژی تشکیل نشان داد که این ترکیب در صورت شکل‌گیری، به عناصر سازنده تجزیه نمی‌شود. مقادیر غیرصفر و قابل‌توجه تانسور پیزوالکتریک نشان‌دهندۀ‌ وجود پیزوالکتریسیته در این ترکیب است. اثر تنش تک‌محور در امتداد محور c بلورشناسی بر روی قطبش، بارهای مؤثر بورن و ضرایب تنش و کرنش پیزوالکتریک این ترکیب نیز بررسی شد. مقدار قطبش با افزایش تنش تک‌محور از مقادیر منفی به مقادیر مثبت افزایش می‌یابد. این تغییرات نشان می‌دهند که تنش کششی، فروالکتریسیتۀ ترکیب را افزایش می‌دهد، در حالی که تنش فشاری می‌تواند منجر به حذف فروالکتریسیتۀ ترکیب شود. بررسی وابستگی ضرایب تنش و کرنش پیزوالکتریک به تنش تک‌محور نشان می‌دهد که با استفاده از تنش می‌توان کیفیت پیزوالکتریسیتۀ ترکیب را بهبود بخشید. این نتایج می‌تواند در حوزۀ‌ مواد جدید پیزوالکتریک بدون سرب حائز اهمیت باشد. The basic principles of calculations in the framework of density functional theory and density functional perturbation theory were used to investigate the elastic and piezoelectric properties of hypothetical SrHfO3 compound in tetragonal structure with P4mm space group. Polarization and Born effective charges tensor were calculated to investigate the nature of ferro-electricity of this system in an atomic scale. Our results show that Born effective charges of both Hf and O atoms are much larger than their anticipated nominal charges which show a strong bonding between Hf and O atoms. Formation energy calculation revealed that the compound will be stable, if it is synthesized and would not decompose to its ingredients. Non-vanishing and significant calculated piezoelectric constants imply system piezoelectricity. The effect of uniaxial stress along the c-axis on polarization, Born effective charges and piezoelectric stress and strain coefficients were also investigated. We found that the polarization increases as the uniaxial stress goes from negative to positive. These changes suggest that the uniaxial tensile stress could raise the ferro-electricity, while the uniaxial compressive stress would cancel it. We also found that the piezoelectricity of this system could be improved by applying stress. These results could be significant in the field of lead free piezoelectric materials. Shi J, Grinberg I, Wang X, Rappe AM. Atomic sublattice decomposition of piezoelectric response in tetragonal PbTiO3, BaTiO3, and KNbO3. Physical Review B. 2014 Mar 21;89(9):094105. Kim S, Lee W-J, Cho Y-H, Shim M, Kim S. Piezoelectricity in PbZrxTi1-xO3 Studied by Density-Functional Perturbation Theory Supercell Calculations. Japanese Journal of Applied Physics. 2013 Aug 26;52(9R):091101. Panda P, Sahoo B. PZT to lead free piezo ceramics: A review. Ferroelectrics. 2015 Feb 26;474(1):128-43. Wan L, Nishimatsu T, Beckman S. The structural, dielectric, elastic, and piezoelectric properties of KNbO3 from first-principle methods. Journal of Applied Physics. 2012 Apr;111(10):104107. Hohenberg P, Kohn W. Inhomogeneous electron gas. Physical review. 1964 Nov 9;136(3B):B864-71. oni S, De Gironcoli S, Dal Corso A, Giannozzi P. Phonons and related crystal properties from density-functional perturbation theory. Reviews of Modern Physics. 2001 July 6;73(2):515-62. Gonze X. Perturbation expansion of variational principles at arbitrary order. Physical Review A. 1995 Agu 1;52(2):1086-95.
 de Gironcoli S, Baroni S, Resta R. Piezoelectric properties of III-V semiconductors from first-principles linear-response theory. Physical review letters. 1989 June 12;62(24):2853-6. Giannozzi P, De Gironcoli S, Pavone P, Baroni S. Ab initio calculation of phonon dispersions in semiconductors. Physical Review B. 1991 Mar 15;43(9):7231-42. King-Smith R, Vanderbilt D. Theory of polarization of crystalline solids. Physical Review B. 1993 Jan 15;47(3):1651-54. Wu X, Vanderbilt D, Hamann D. Systematic treatment of displacements, strains, and electric fields in density-functional perturbation theory. Physical Review B. 2005 July 5;72(3):035105. Nunes R, Gonze X. Berry-phase treatment of the homogeneous electric field perturbation in insulators. Physical Review B. 2001 Mar 28;63(15):155107. Ghosez P, Junquera J. First-principles modeling of ferroelectric oxide nanostructures. ARXIV:condensed matter materials science. 2006 May 11. Available from: arXive:cond-mat/0605299. Resta R. Macroscopic polarization in crystalline dielectrics: the geometric phase approach. Reviews of modern physics. 1994 July 1;66(3):899-915. Vanderbilt D, King-Smith R. Electric polarization as a bulk quantity and its relation to surface charge. Physical Review B. 1993 Aug 15;48(7):4442-55. Zak J. Berry’s phase for energy bands in solids. Physical review letters. 1989 June 5;62(23):2747-50. Resta R, Posternak M, Baldereschi A. Towards a quantum theory of polarization in ferroelectrics: The case of KNbO3. Physical review letters. 1993 Feb 15;70(7):1010-13. Zhong W, King-Smith R, Vanderbilt D. Giant LO-TO splittings in perovskite ferroelectrics. Physical review letters. 1994 May 30;72(22):3618-21. Sághi-Szabó G, Cohen RE, Krakauer H. Erratum: First-Principles Study of Piezoelectricity in PbTiO3 .Physical Review Letters. 1998 May 11;80(19):4321. Gonze X, Amadon B, Anglade P-M, Beuken J-M, Bottin F, Boulanger P, et al. ABINIT: First-principles approach to material and nanosystem properties. Computer Physics Communications. 2009 July 16;180(12):2582-615. Perdew JP, Burke K, Ernzerhof M. Generalized gradient approximation made simple. Physical review letters. 1996 Oct 18;77(18):3865-68. Kennedy BJ, Howard CJ, Chakoumakos BC. High-temperature phase transitions in SrHfO3. Physical Review B. 1999 Aug 1;60(5):2972-75. De Jong M, Chen W, Geerlings H, Asta M, Persson KA. A database to enable discovery and design of piezoelectric materials. Scientific data. 2015 Sep 29;2. doi:10.1038/sdata.2015.53. Vali R. Structural phases of SrHfO3. Solid state communications. 2008 July 14;148(1):29-31. Cherrad D, Maouche D. Structural, electronic and optical properties of SrHfO3 (I4/mcm, Imma, Cmcm, P4/mbm and P4mm) phases. Physica B: Condensed Matter. 2010 Sep 15;405(18):3862-8. Zeng Z, Calle-Vallejo F, Mogensen MB, Rossmeisl J. Generalized trends in the formation energies of perovskite oxides. Physical Chemistry Chemical Physics. 2013 Mar 20; 15(20):7526-33. Duan Y, Shi H, Qin L. Studies of tetragonal PbTiO3 subjected to uniaxial stress along the c-axis. Journal of Physics: Condensed Matter. 2008 April 3;20(17):175210. Born M, Huang K. Dynamical theory of crystal lattices. Clarendon press; 1954. Ghosez P, Michenaud J-P, Gonze X. Dynamical atomic charges: The case of ABO3 compounds. Physical Review B. 1998 Sep 1;58(10):6224-40. Posternak M, Resta R, Baldereschi A. Role of covalent bonding in the polarization of perovskite oxides: the case of KNbO3. Physical Review B. 1994 Sep 15;50(12):8911-4. Liu Q-J, Liu Z-T, Feng L-P, Tian H, Liu L, Liu W-T. Mechanical and thermodynamic properties of seven phases of SrHfO3: First-principles calculations. Computational Materials Science. 2010 Mar 3;48(3):677-9. Mouhat F, Coudert F-X. Necessary and sufficient elastic stability conditions in various crystal systems. Physical Review B. 2014 Dec 5;90(22):224104. Harrison WA. Electronic structure and the properties of solids: the physics of the chemical bond. Courier Corporation; 2012.